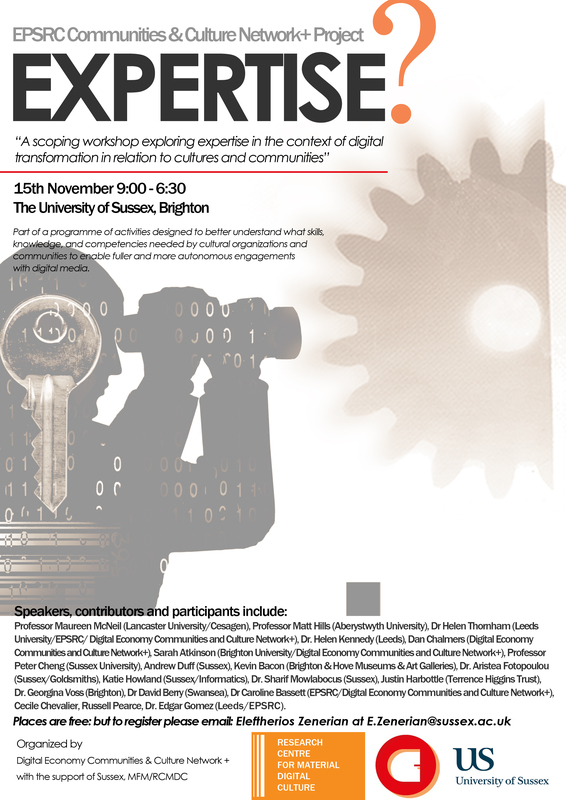 A day-long workshop and symposium exploring Expertise and Digital Transformations. Part of a programme of activities designed to better understand what skills, knowledge, and competencies, cultural organizations and communities need to enable fuller and more autonomous engagements with digital media. Professor Maureen McNeil (Lancaster University/CESAgen), Professor Matt Hills (Aberystwyth University), Dr. Helen Thornham, (Leeds University/EPSRC/Digital Economy Communities and Culture Network+), Dr. Helen Kennedy (Leeds University), Dan Chalmers (Digital Economy Communities and Culture Network+), Sarah Atkinson (Brighton University/Digital Economy Communities and Culture Network+), Professor Peter Cheng (University of Sussex), Andrew Duff, Kevin Bacon (Brighton and Hove Museums and Art Galleries), Dr. Aristea Fotopoulou (University of Sussex RCMDC/Goldsmiths), Dr. Katie Howland (University of Sussex), Dr. Sharif Mowlabocus (University of Sussex), Justin Harbottle (Terrence Higgins Trust), Dr. Georgina Voss (University of Brighton), Dr. David Berry (Swansea University), Dr. Caroline Bassett (University of Sussex/EPSRC/Digital Economy Communities and Culture Network+), Cecile Chevalier, Russell Pearce, Dr. Edgar Gomez (Leeds University, EPSRC). We have limited places. To attend please email: Eleftherios Zenerian <E.Zenerian@sussex.ac.uk>. This entry was posted in community and culture, Conferences and papers, Digital media and tagged Centre for Material Digital Culture, Digital Economy Communities & Culture Network+, digital expertise, University of Sussex on October 19, 2012 by Aristea Fotopoulou.